This function creates a campaign that enable the customer to collect points when buying items. The points collected can be used to redeem items later on. Click 'New Campaign' to create a new reward campaign. A pop up dialog will ask 'Create a new campaign?'. Click 'OK'. Code - use to sort the order of campaigns that appear in the drop down list. A campaign with a code starting with 100 will take precedence over one beginning with 200. Status - whether the campaign is ongoing or not. 'Active' means it is ongoing, 'Inactive' means it is not ongoing. Branch - in which location is the campaign taking place. If the campaign is launching in more than one branch, enter the branch code for each branch and separate them by comma. Note: Please be sure to click 'Confirm & Save' once you have entered the details or they will not be saved. When you have modified or added rules to the campaign, remember to click 'Confirm & Save' or the campaign will not be saved. Click 'Delete Campaign' to remove the campaign from the system. Click 'Add Rules'. A new screen will pop up. Sequence is a code that used to sort rules. If a campaign has more than one rule, when the system is processing, it will go through the rules according to the sequence, after it finds a match, it will stop. 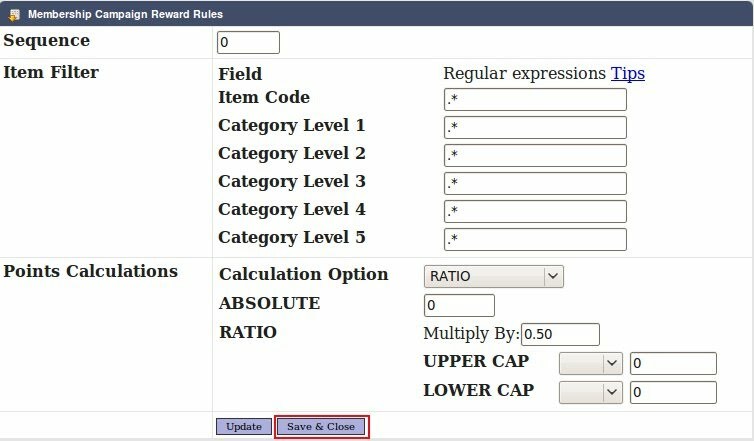 To apply a rule to all categories in a level or to all item codes, you may use ". *" (a dot followed by an asterisk). For further information on rule patterns, please refer to Regular Expressions for Rules. Do not under any circumstances leave this blank, or put just a "*" or just a ".". It will render the system unable to perform cash-sales! Absolute - give the customer the value entered per-item. For example: Absolute point value = 10. If customer bought 3 items in a cash sale. Customer gets 10*3 = 30 points. Ratio - give the customer the value entered multiplied by the total amount per item type. For example: Ratio = 0.1. If customer bought 3 items that worth RM45 in total. Customer gets 45*0.1 = 4.5 points. This figure is then rounded down, so the customer gets 4 points. Upper cap prevents the customer from gaining more than a specific number of points per cashsale. Lower cap ensures that all customers receive a minimum value of points per cashsale. Click 'Save & Close' to exit from the screen. Now you will return to the previous screen. The rules will be listed as shown. The transaction of rewarding points can only take effect in the full-screen cashsale. When using the fullscreen cashsale, users will see the reward points text in red color when selecting items.